Fenzi Dog Sports Academy - EasyBlog - PODCAST E100: Loretta Mueller - "Small Space Skills for Agility"
Today we'll be talking to Loretta Mueller. Loretta has been involved in agility since 2003. She and her dogs are no strangers to the finals at the USDAA World Championships, and she coaches the World Agility Organization (WAO) USA Agility Team. She also runs Full Tilt Agility Training in central Minnesota. Outside of the agility world, Loretta has been involved in herding, competitive obedience, rally, and service dog training. Loretta Mueller: Hi Melissa. Thanks for having me again. Melissa Breau: Excited to talk! To start us out, can you just remind listeners how many dogs you have and a little about who they are? Loretta Mueller: Sure. I have five Border Collies: Klink, who is 13, and Gator, who's 12, and then I have littermates Even and Lynn, both 10 years old — I would not recommend doing that, ever; I won't ever do it again — and Gig is my 4-year-old girl. She's my youngest. Melissa Breau: I asked you on today because I wanted to talk about the class you're offering this session, Agility In Da House! When most people think about agility training, they probably think bulky equipment and big training spaces. Is it possible to train agility without those things? Loretta Mueller: Yes, absolutely. I think that many times handlers get so caught up in trying to run full courses. They think they have to be in huge facilities and they have to own their own A-frame and dog walk and all that kind of stuff. But I think overall a lot of times we have a tendency to forget the big picture, where in reality, working at home on the foundations and basics will really help them improve in agility. In my opinion, it always comes back to foundation work. If your dog is struggling somewhere, there's normally a few foundation pieces that either you're missing or maybe have gone to the wayside that you need to go back and revisit. Melissa Breau: What aspects of the sport can handlers work on on those days they can't make it to the field and are just training indoors and at home? Loretta Mueller: You can work on impulse control, a lot of that, you can work on start lines, you can work on turns, drive training, contacts, weave poles, things like that. Again it's all about creativity. I've even trained a running dog walk in the hallway of my house. I'm from Minnesota. Two days ago it was 40 below 0, so we're not going to go outside anywhere. You have to get pretty inventive sometimes, but I think that's the goal is to think outside of the box. People have a tendency to get stuck in, "What should I do at my training class?" and "I don't have this available to me at home." But, in reality, if you just go outside of the box and think about maybe this involves moving some furniture, or maybe it involves putting down some matting, or looking for objects around the house in order to train these skills. I think that's one of the biggest things that I find that people gain from this is the ability to be very imaginative and creative and figuring out what they can actually do. It's kind of funny how we start figuring out spaces and people say, "OK, I'm moving my couch this way," and stuff like that. Again, is it a bit of a pain to move your couch and stuff? Yes, absolutely. But in the scheme of it, you're doing something with your dog, probably when they're already pent up anyway — it's too hot, it's too cold, or whatever — and so you're getting some work on your dog, and mental work is always settling for them, so I think it's definitely worth it. So yes, imagination, creativity. It's really fun to see what the students come up with in the class. So you can definitely train just about anything inside, even a dog walk. Melissa Breau: I'd imagine that just learning to think that way and think creatively probably has a lot of carryover no matter what the sport and no matter what it is they're working on. Loretta Mueller: Absolutely. For sure, yes. Melissa Breau: Thinking through the skills that you mentioned there, how do those things actually translate to having a better agility dog? To ask it another way, why is it valuable to work those skills at home or away from the field? Loretta Mueller: Because in reality you're building values in behavior, so if you think about that, the more value you build, the more instilled the behavior is. A lot of the behaviors that you're looking for agility dogs, and a lot of the behaviors that break, are based on the behaviors that are not instinctive for the dogs. Most dogs, if not allowed to jump for a while, they still remember how to jump. They still remember how to do tunnels. Most dogs don't forget those kinds of things. It's the things that aren't instinctive to them that they have a tendency to forget, so committing to obstacles while you move away, ignoring your motion, weave poles, contacts, stop contacts is a good example. No dog runs to the bottom of a hill and stops. They keep running. Those kind of things are non-instinctive, and they require a lot of value-building and a lot of value to keep them going, so you have to make sure that you're constantly putting value on those. The more you proof those behaviors, then what happens is the better the dog is prepared for things that come up that could derail the behavior, such as other dogs barking, and people, and all the kinds of distractions that you see in agility. Agility has got so many distractions that happen when the dog is on course, or before going in the ring, or even just hanging out at crating. So it's really important to proof those behaviors, if you have them taught, so that you can keep those values built. You can many, many times replicate issues that you have at trials, or at training, at home — again, as long as you get creative with it. Melissa Breau: How does that correlate to where different dogs are in their training? I know you mentioned that you have some beginners and some more advanced dogs in the class. Can you talk a little bit about that? Loretta Mueller: Absolutely. Most of the time, if there are issues with agility dogs, what do they normally tell you to do? Return to some foundations. I know foundation is not always the most exciting thing in the world. Spending five minutes teaching a two-on, two-off contact — not super-exciting. Running a really fun course — obviously more exciting. But the dogs are the same way, so running a full course, crazy like that, and having a great time chasing your mom, chasing your dad, is awesome. Two on, two off, nah, probably not as awesome. So it makes it that much more important that we again build value and make sure that we work on those pieces all the time, or as much as we possibly can. Handlers don't always want to do that, but if you do keep revisiting the foundations, you will have a more consistent dog. Over time, we degrade behaviors, and I say that we degrade them because we love running agility, period, so we will let things slide, possibly, then the behavior breaks down, people will say, "No, no, no, I don't do that." You know what? I'm guilty of it. At some point in time, everybody is. Let's say the dog doesn't do a perfect contact, but you're still running. Well, all right, it's no big deal. Then the problem is that's the point of degradation. You have to think of it like a bank account: you have to keep putting money in to draw money out later. So working on foundations on a regular basis is really a good plan to keep those behaviors solid. In my opinion, anytime you're stuck in the house — whether it's too cold, hot, raining, whatever — it's a great time to brush up on those not so super-exciting things. That way, you have more consistent behaviors when you do get to training or you do get to a trial. Because I'll be honest with you: there are times when my dogs don't trial for many months, and when they go into the ring, I can trust their behaviors because I've been working on foundations in most of their training. Melissa Breau: Can you share a little about how your class on all this stuff actually works, how it's set up? Loretta Mueller: Sure. We work on foundation behaviors. Like I said, either teaching the dogs behaviors themselves, so we have some dogs that don't have any agility experience or are brand new to agility, maybe their handler has more experience, or we're working on making behaviors more solid for seasoned dogs. Or also fixing some behaviors for seasoned dogs. If the dog has a not so good start line stay, we work on those kind of things in there so that we can get a plan to be able to make that stay solid. I also ask the participants to think outside of the box each and every week. We talk about items around the house that they can help use to train. We also figure out all the options for specific items, and during the class we'll go into that. Again, I really want to foster the ability to think about how to maximize their space to get the most out of the training they can do, and so I think it's really important that that part of the process is revisited every week, so that people can, when the class is over, be able to use the space they have in the best possible way for their dog. Melissa Breau: Can you maybe walk us through an example of an exercise folks can work on, a skill they need for the sport but might not realize they can train at home, even without a lot of space? Loretta Mueller: Let's start with the ability to go into drive and then come back down out of drive. This is a skill many dogs lack in agility, and you'll see it when they're running on course. They'll go up in drive and possibly stay in drive and go over threshold. When you see that in a dog, you'll see broken start lines, broken contacts, jumping up at the handler, "shopping," as I call it, where they just run around and take tunnels or jumps or whatever without really paying attention to the handler. I want my dogs to go into drive on certain occasions, so with five Border Collies in the house, I don't want them all on drive all the time because that would not be a good experience for me as a dog owner. So what we do is we teach the dogs to get into drive on command. My dogs are all asleep right now and I'm not going to use the word, because if I do it, they will all wake up and start barking because they'll go into drive. But the word I have is r-e-a-d-y, so as long as you guys can spell, you know what that is. I'm not saying it right now because I have five dogs asleep right next to me on the couch. But if I say that word, they will go immediately into drive. If I don't say that word, they don't go into drive. So it's nice to have that ability as an on/off switch, and then also the ability to self-calm or bring themselves out of that heightened state, which is a great skill for any agility dog. If your dog is low drive, it teaches them to go into a higher state of drive on command, and if your dog needs to learn how to calm themselves down, a.k.a., they've got too much drive and over threshold, it also teaches them how to self-calm. So it's a win-win. If you think in terms of how that extrapolates to agility, what comes into play would be the table. For many people, if you talk to people about what their least-favorite obstacle is in agility, many of them will do an eye roll and say, "The dreaded table." The reason why the table is so disliked, I guess, is because it requires the dog to run full speed for multiple obstacles and then stop for five seconds, and for many handlers those five seconds are the longest five seconds of their entire life because many dogs just don't want to do that. So many dogs will struggle. They will stay in a high state, and stopping just isn't in their mindset. So if you see dogs at trial that freeze and just kind of glaze over, or they ignore their handlers, then the handlers start having to try to get over the top of them, which of course is not a good thing. But this type of training really helps with that, and it helps the dog understand that there will be times when you will be going full speed and I will ask you for a controlled situation. So that's just one of the examples that we go through in the class to help with when you do get to training or you get to trialing. Melissa Breau: Do the dogs need any particular skills coming into the class, before taking the class? How can people decide if they and their dog are ready or a good fit for the Agility In Da House class? Loretta Mueller: Really, all you really need are a dog and some rewards — food or toys. That's pretty much it. We have young dogs, older dogs, like I said, it doesn't really matter. We're not doing anything that would require the dogs to do super-physical things as far as impacting their joints or anything like that. If you want to work on just foundation skills, either with a young dog, or revisit skills with an older dog, this class is definitely that something you should look into. Again, if you're stuck inside and don't have much access to a training area, but you have some space in your house and you want to do agility and figure out exactly what you can do in that space, this is a class for you. Melissa Breau: I know it's small spaces, but is there a too small? Loretta Mueller: I'll be honest with you: I've seen some pretty small spaces in this class and we've made it work. So you're going to see all different sizes of areas. I've seen areas as small as a 5x6 or 5x7 area rug all the way up to bigger spaces where I wouldn't even consider them that small, like, "That's huge. You can do all sorts of stuff in there." I always say 5x7 is pretty small, and if you've got something a little smaller than that, you might again move some furniture or something. But we can make things work, because a lot of the stuff I'm doing is actually on a 5x7 space, so that's pretty darn tiny. Melissa Breau: Can you share a little more generally on what you will and won't cover in the class and anything else that folks need to know? Loretta Mueller: We cover the foundations, like I said: stays, handling, some contact work, impulse control, stuff like that, things that you need in order to do agility and also things that you need in order to just have a functional dog in that environment, very high- speed, high-energy environment. We don't teach full obstacles and we don't get into weave poles in that class, just because I want it to be open to as many ages as possible, and I think weave pole training is best left to dogs that are a bit more physically able and older, so I want to make sure that people with puppies can take advantage of the class. As far as what you should expect, you will see different levels of how we work on particular skills. The Golds, like I said before, range from totally new to seasoned agility dogs. You'll get to see how we take each step to a higher level and then how we take these seasoned dogs and bring them back down to basics, how we proof behaviors and then what the end results will be. And I'm sure, because it happens every time I've taught this class, there are some dogs that we have to deal with possible emotional stuff that we have to also work around, so there will probably be a couple of dogs in that group that usually end up having that. Usually it's with the impulse control stuff, but it all depends on the dog. So we have a pretty wide variety. It's pretty cool to see the groups and the different breeds and stuff that we've got this time around, so I'm pretty excited about it. 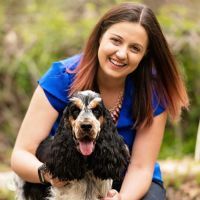 Melissa Breau: So my last question here — what's something that you've learned or been reminded of recently when to comes to dog training? Loretta Mueller: The one thing that I was taught just a couple of days ago, or I guess reminded of, maybe, is that dogs give us all the feedback we need; we just have to listen to them. And as long as we listen, we will have communication. If we think that we have to do something in a very specific way and we get ourselves stuck inside a box, then what happens is we cut off that communication line. So listen, look at feedback — feedback is never anything more than feedback. It's not failure. It's just the dog telling you what they understand and what they do not understand. We just have to listen to them. Melissa Breau: Thank you so much for coming back on the podcast Loretta! This has been great. Loretta Mueller: Thank you for having me. I appreciate it. We'll be back next week with Hannah Branigan to talk about everyone's favorite topic … heeling! PODCAST E89: Barbara Currier - "Learning to Love the Weaves"